MANCHESTER, England -- Singer Ariana Grande has returned to the stage two weeks after a suicide bombing killed 22 people at her concert in Manchester. 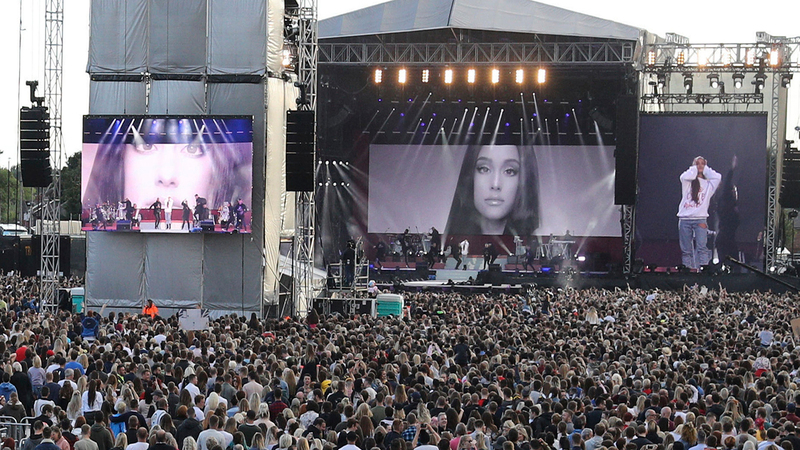 Grande emerged onstage for the One Love Manchester concert Sunday. She appeared teary-eyed and emotional as she performed her hits "Be Alright" and "Break Free." The concert will be broadcast on a variety of outlets. ABC plans a one-hour highlight special at 12:05 a.m. following Eyewitness News at 11. The concert also will be broadcast on more than 130 iHeartRadio stations, and MTV will livestream the event on the website www.onelovemanchester.mtv.com. She told the audience, "Manchester, we're gonna be all right." Before her performance, she and her dancers held hands in solidarity. Sunday's concert will raise money for victims of the attack that struck at Grande's show on May 22. The show is broadcasting across the globe and proceeds will go to an emergency fund set up by the city of Manchester and the British Red Cross. Other artists performing include Miley Cyrus, Justin Bieber, Take That, Katy Perry and others. The concert comes the day after attackers targeted the heart of London, killing seven people. Authorities have said the attack started with a van plowing into pedestrians and then involved three men using large knives to attack people in bars and restaurants at a nearby market. Grande's manager, Scooter Braun, said Sunday that the concert will go on as planned. He called the event a "statement that hatred and fear will never win." The show will be broadcast across the globe and proceeds will go to an emergency fund set up by the city of Manchester and the British Red Cross.